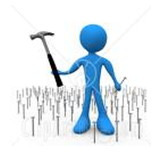 Stop approaching your customer interactions like a hammer to a nail. That's what yesterday morning's MITX panel discussion, Integrating Cross Channel Customer Experiences, was all about - seeing the broader goal as opposed to many singular goals (social media, mobile, web, etc.) Cesar Breamoderated the conversation today, and truly gave the audience some thoughtful insights. Colin Hynes of Staples kicked off the discussion with perhaps one of the most notable shining stars of cross-channel integration of experiences: Target. As Colin delineated the story of his shopping experiences with Target, it was easy for all to understand why integrating across channels is so critical; by creating a practical, positive experience for customers, Target builds loyalty (even from a competitor!). Colin emphasized that Target is constantly pushing mobile, and linking that back to the customer experiences in the stores - because it makes the overall process so much easier to shoppers. Colin outlined the process of where to begin integrating, from a brand perspective, in 3 questions: What are people bringing to the store? What are associates bringing to the store intellectually? What can be provided to the associates to enable them to improve the customer experience with technology? Essentially, determining cultural and behavioral dynamics is critical to outlining what and how to integrate channels. When asked how to integrate a newer medium like mobile when faced with the baggage people carry over from older paradigms, Rob Schmults referenced the introduction of online ads. Just as we saw print professionals taking their expertise and recreating it in clickable form, we now see website professionals recreating tiny sites for phones. From this, Rob harped on his main point - moving to other channels and integrating is about if you SHOULD not COULD; make sure it's solving a problem. Judah Phillips spoke to Cesar's point that enabling governance to integrate cross channel efforts is tricky and needs structure. To do so, he explained, it's necessary to figure out stakeholders, goals, and paths to achieve those goals, and make sure the goals are communicated early in the process between teams. (Judah's best practice tips can be heard in his live interview here.) Judah was the fountain of wisdom for resources on integration, so be sure to check out his book list. Manu Mathew clarified that creating a framework to prevent train wrecks in integration is possible through the use of data. Providing the same data and information to all teams will create a unified perspective. Colin spoke to a specific framework Staples is using - Red Rover. Yes, like the childhood game. Cross-pollinating team members creates opportunities to learn and share perspectives. In terms of handling customer retention with a fragmented identity, Manu explained that his company assigns new customers to a cluster in order to decide what channel is best to interact with them through. As Cesar later pointed out, integration like this allows for better follow up, which can intercept negative experiences and improve social feedback. So what to do if your client won't stop being a hammer? Don't give it all up to "Excel anarchy" (data, data, data) - bring the customer into the conversation and SHOW the client their behaviors and needs, which will open up thoughts for addressing those needs. (Rob warned against confusing correlation with causality though - just because we know how to communicate with customers doesn't mean we need to hang out ALL the time.) He cited usertesting.com, chat logs, reviews, and social channels for a great feedback tool that makes breaking the hammer easier. Share your success stories, thoughts, challenges, or progress under Comments, or tweet it up with hashtag #MITX. Feel free to share any other feedback on the event in our survey here. You can find all of the panelist interviews on the MITX YouTube Channel.